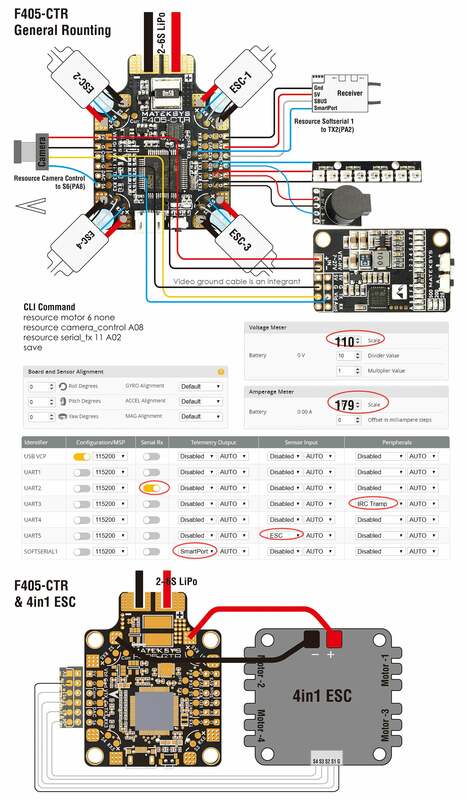 The F405-CTR flight controller is the latest iteration of the popular F405 family from Matek Systems and we think they've really nailed this version. The features and flexibility of this board are near endless. The board has a few changes and some welcome additions. Firstly, it uses the tried and tested MPU6000 gyro which is less sensitive to noise. They also added a barometer sensor (BMP280) on the I2C bus which many will welcome, particularly those whom are interested in actual droning ie. Autopilot software such as iNAV (links down below). The SD card reader is now also full length to help secure and protect your SD card when blackbox-ing. The board layout also make provisions for ESC telemetry by placing RX5 at every ESC soldering point. They now include soft-mounting grommets instead if standoffs which allow for better compatibility with frames that use long standoffs to mount the FC. If you still prefer the standoffs with built in soft-mounting they an be found here.